The first uncensored letter from a Briton held at Guantanamo Bay shows he has been tortured, his lawyers claim. 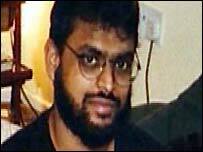 Moazzam Begg, 36, has been detained at the US military base without trial for two-and-a-half years. His letter said he had been tortured, threatened with death and kept in solitary confinement since early 2003. The US military has denied abuses at the camp, but said the questioning of detainees had provided "vital" information about al-Qaeda. Mr Begg's lawyers said the government was now "compelled" to take "immediate steps" to pass the evidence to the UN and have the US held responsible. Human rights lawyer Clive Stafford-Smith said the government should secure the immediate repatriation of Mr Begg. He said there was "no way" Mr Begg could be tried at Guantanamo, especially given the suggestion his evidence had been "exacted through torture and abuse". His legal team will on Monday demand in a US court that the US Government declassifies details that currently cannot be revealed about torture allegations made by Mr Begg and others. A lawyer from the defence team who visited the camp recently was forbidden under US law from discussing the details of any allegations made. "There are many many details of torture that have yet to come out of Guantanamo," said Mr Stafford-Smith. Mr Begg's father Azmat said it was "terrible" to see what he had always suspected written in black and white. On Friday lawyer Gareth Peirce said the government's route of diplomacy in dealing with the British detainees had "entirely failed" for the last two-and-a-half years. Mr Begg's letter was an "absolute cry for help", directed straight at the British Government, she said, later adding he may have written hundreds before which never got out. Ms Peirce said the UK Government should publicly refuse to continue to be "complicit" in covering up what was going on. "The methodology, the construction of this appalling camp in Cuba, is tantamount to a camp that is there for the sole purpose of torture. There is no other," she said. Mr Begg is one of four Britons being held at Guantanamo Bay. Also detained are Feroz Abbasi, Martin Mubanga and Richard Belmar, who are all from London. Mr Begg's letter, dated 12 July 2004, was an "oddity" that may have reached them unclassified and uncensored by the US by mistake, said his lawyers. In it he demanded his rights under US and international law, saying he should be released immediately. All charges against him should be presented "unambiguously," he added. Mr Begg asked in the letter for answers over the "violations and abuses" he has suffered. Any statements he had signed were done so "under duress", he added, insisting he was an innocent "law-abiding citizen of the UK". During interviews - mostly, but not solely, in Afghanistan - he claimed he was subjected to threats of, and actual, torture. He had also faced religious and racial abuse, he said. He claimed he had heard other detainees being tortured, and believed this had led to the deaths of two men, which he said he "partially witnessed". Ms Peirce said the letter would explain why Mr Begg was the only detainee who had not been seen by others. "I would say that he has been held separately because he has witnessed murder, and therefore he is in a unique position." Copies of the letter have been sent to Tony Blair, Home Secretary David Blunkett, Foreign Secretary Jack Straw and the Attorney-General Lord Goldsmith, said Mr Begg's legal team. The Foreign Office said the welfare of British detainees at Guantanamo had been a priority for the government "from the outset" and that it continued to pursue complaints raised with the US authorities. It said during welfare visits to the military base, Mr Begg had not alleged systematic abuse there, but had claimed mistreatment at Bagram, which was being investigated by the US. Mr Begg was arrested in Pakistan before being moved to Cuba. Five other Britons who spent up to two years at Guantanamo Bay were handed over to British custody in March and then freed without charge. They also made allegations of abuse.